Thanks to Ivan Godfrey and to Tony Wood of the HMRS for help with this section, and to Michael Dunn of Kidderminster Railway Museum for his help and in particular for providing me with the official painting specifications. The GWR building livery remained largely unchanged from deep in Victorian times when the first written references are to be found, to the end of the grouping period except that a colour officially called 'chocolate' was widely used in the 19th century but fell out of use after 1900 and at around the same time Stone no.2 ceased to be used following the introduction of ready mixed paints (see below). colour. Stone 1 or stone 2 could be used for large areas like planking and canopies, with the darker Stone No. 3 for doors, metalwork and the like. According to 'Great Western Way', if Stone 1 was used for the topcoat, Stone 2 was used as the undercoat and vice versa, so that the other colour showed through when the paint was worn as an indication that repainting was due. All three shades were made by mixing iron oxide (ochre) with white lead mixed with linseed oil; the greater the amount of iron oxide, the darker the shade. Great Western Way suggests that Stone no. 2 was the most widely used until the 1900's but gives no evidence for that statement, and it should be noted that the official specification for signal boxes dated 1907 and reproduced below makes no mention whatsoever of Stone no. 2. The other official shade was 'chocolate', a warm rich maroon/brown with a reddish tint and this was used more than Stone no. 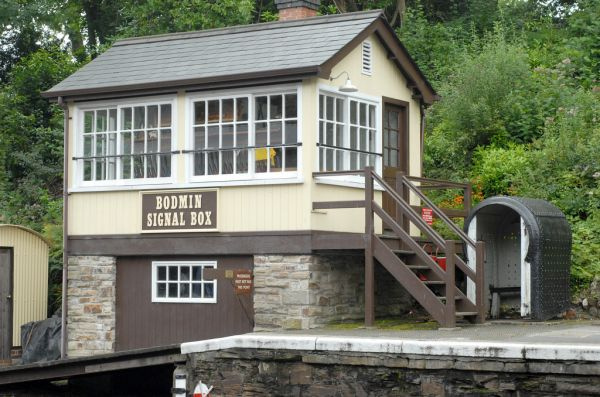 3 on signal boxes up to around 1907 and the same may have applied to stations before that time. By 1907 and possibly before the GWR was buying ready mixed paints in tins; one supplier was Williamson's Ltd and their records make no mention of Stone no. 2 which suggests that from that time on only Stone no. 1 and Stone no.3 were used......certainly all the colour pictures I have seen from the 1930's, 40's and 50's show a light shade for planking etc. which indicates Stone no. 1. Presumably the GWR decided when they moved to ready mixed paints that there was no point using three or four shades when two would do the same job perfectly well so the chance was taken to simplify things. A second supplier was the Torbay Paint co. who supplied paint under the 'Ripolin' trade name which is referred to specifically in the 1907 specification. This company advertised in the GWR Magazine in the pre 1914 period. To put it simply, in the 19th century three shades of stone were in use together with chocolate brown, and in the 20th century only Stone no. 1 and Stone no. 3 were widely used which simplifies matters considerably for modellers. In both periods window frames and glazing bars were always white. The Lead Paint Act was introduced in 1926 after which lead free paints began to be manufactured which again might have had slightly different tones and would certainly have weathered differently from the lead based paints. In 1931 the next change was made to the livery when a maroon was introduced for guttering, downpipes and hardwearing areas like steps on footbridges. Everything else remained as it had always been; I do wonder if they had a lot of 'Coach Lake' left at Swindon works, and had to find some use for it! Window frames & glazing bars were still painted white. Some wooden buildings were painted with the lower walls in chocolate brown in later years, which should be obvious from a B&W photograph....this seems to have been the only use made of the chocolate colour during this period. 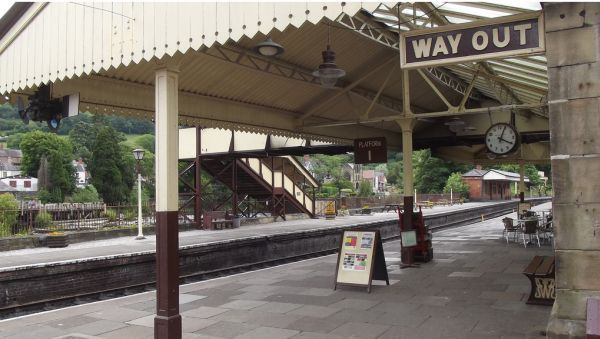 GWR poster boards were black with the beading painted in white, as was the lettering; station signs were the same, and cast iron notices were also black & white. Enamelled notices were dark blue with white lettering. 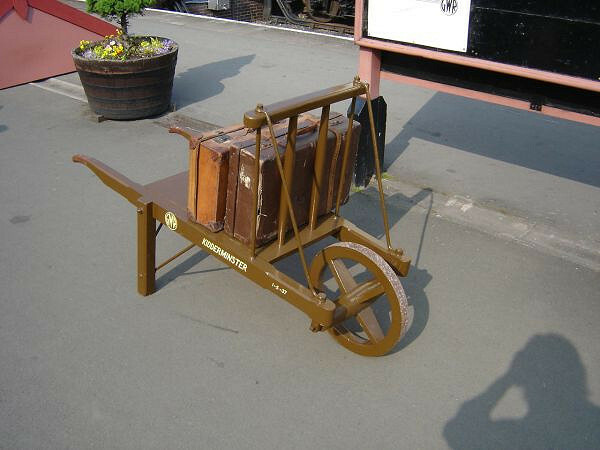 Platform barrows were a 'milk chocolate' brown with black wheels & lettering in straw/cream......the restored examples on the SVR are a good reference. The brown seems to have been a shade used only for barrows; it was lighter than coach brown and totally unlike Stone No. 3.....see the photo below. Fencing was painted in either Stone No. 1 or No. 2 to match the station building, but gates could be white to make them stand out, something which should be clear from photographs. In a few places such as Hungerford, early enamelled signs survived over doors or as running in boards; these had dark blue lettering on a white background, or could be white on blue. 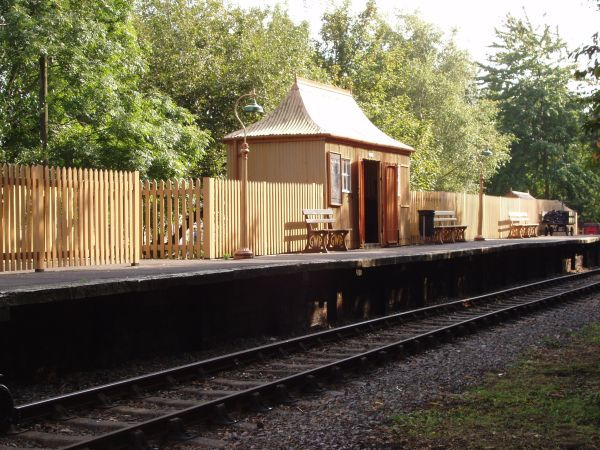 Some wooden goods sheds were not painted but the wood was finished with preservative such as creosote which gave a black shade when newly applied which weathered to a mid grey over time. Doors & windows etc. were still painted in the usual way - B&W photo's make it easy to identify sheds finished like this. 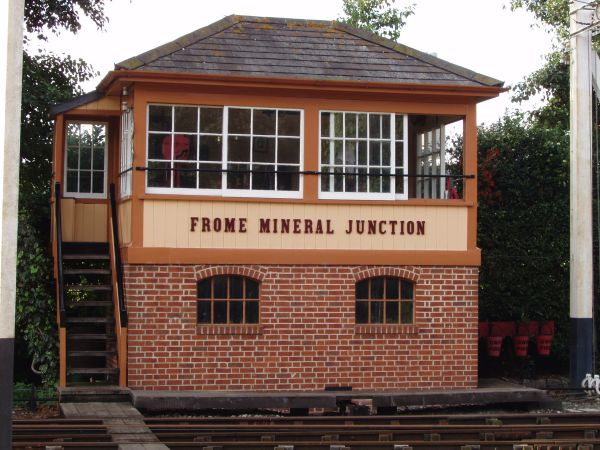 planking as in the photo below of Frome Mineral Junction box, restored at Didcot. The cast iron nameboards came into use in January 1891 though initially their use was not widespread. By the mid 1890's pretty much every signal box had been fitted with the new nameboards and it must quickly have become clear that the old colour scheme was not satisfactory for the smaller lettering on the new nameboards resulting in the new regulations issued in 1898. Interior walls of brick or stone buildings were plastered and painted with distemper, which was supplied in white, cream, brown, Ivy Green, Dark Green and Cambridge blue. One of the darker shades was used up to dado level, with a lighter shade above. Wooden buildings were painted internally in the same colours as were used on the outside. Interior walls of loco sheds, goods sheds, and sometimes wooden trainsheds were also painted white which should be clear from photographs.....Kingswear train shed was an example of this, another station that was never repainted into BR colours. 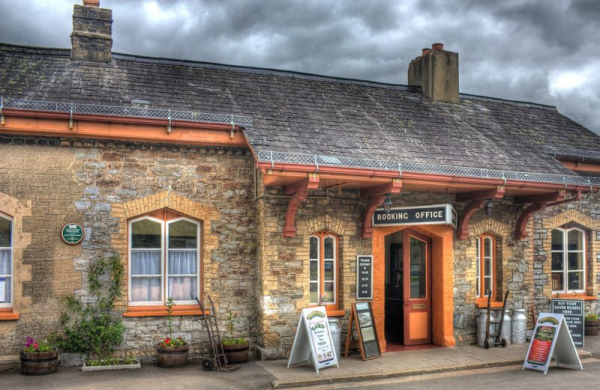 The list of official GWR paints for buildings was: 1.Stone colour 2.Stone colour 3.Stone colour 4.Chocolate brown. 5.Bridge green 6.Steel grey 7.Signal red. As far as modellers are concerned, stick to the paints I have listed below and you'll be fine. 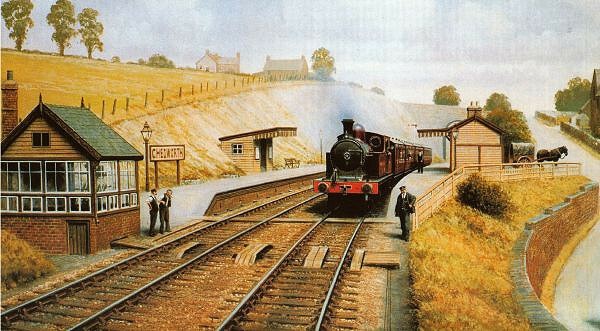 There are a number of published colour photo's of stations in GWR paintwork; Barbers Bridge station on the cover of GWR Country Stations Vol 2, Fairford on the cover of GWR branch line modelling Vol 1, and the colour pictures in 'The Big Four in Colour'.....the book by Lightmoor Press on the Newent branch is full of useful colour pictures. Late surviving stations in GWR paintwork were the stations on the Chard branch, the Fairford branch and the Newent line, none of which were repainted by BR. PAINTS FOR MODELLERS: Presision P21 GWR Light Stone No.1 & P22 GWR Dark Stone No.3. For the maroon I use Precision GWR Coach Lake, and for chocolate brown Precision GWR coach brown or Tamiya flat brown mixed with maroon. 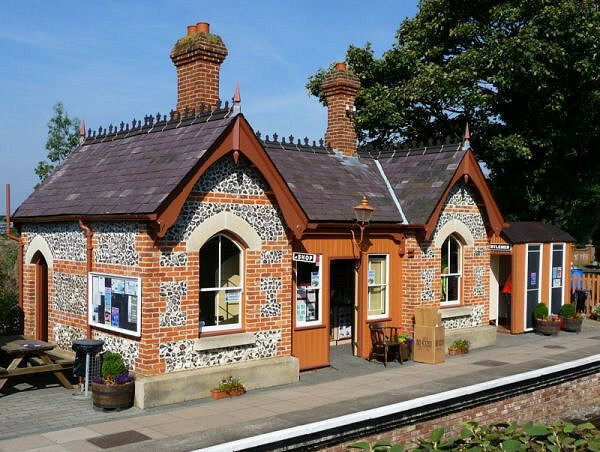 PAINTS FOR PROTOTYPE RESTORATIONS: Dulux 2030Y40R GWR light stone Dulux 4030Y70R GWR dark stone Dulux 7020Y90R GWR brown (benches, barrows, etc). BEST PLACE TO SEE IT: Didcot Railway Centre, Severn Valley Railway, South Devon Railway, Kidderminster Railway Museum. 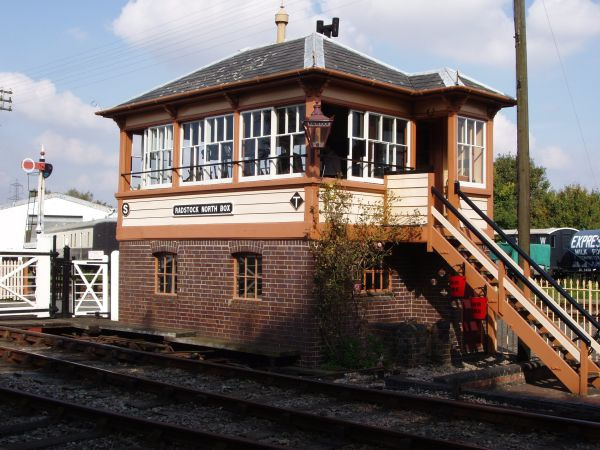 Above is the superb signal box at Didcot, representative of the livery when newly painted. Below is genuine GWR paintwork, abeit rather faded. 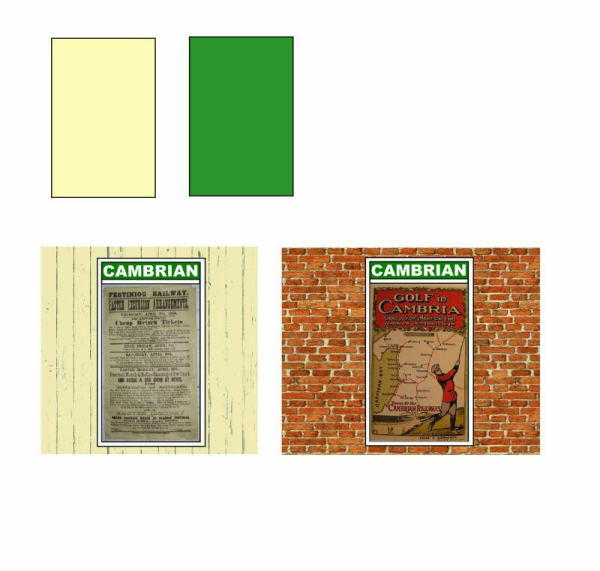 The Cambrian inherited a cream & brown scheme from the Mid Wales railway, but by the beginning of the 20th century had settled on an attractive livery of very pale cream & green, with the green as usual for the doors, metalwork, etc. 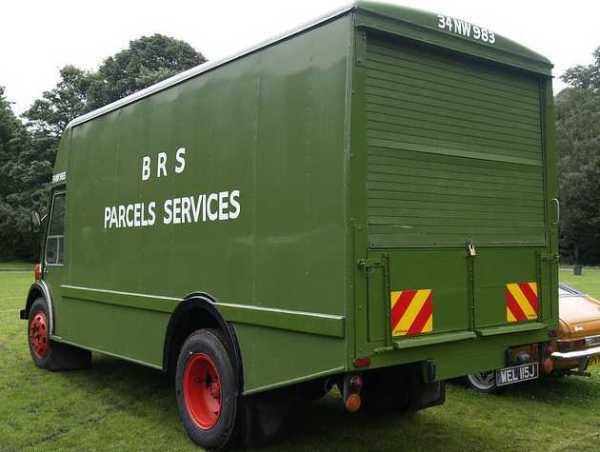 The nearest match to the green is that once used by British Road Services. The cream has also been described as white, so either a white paint had yellowed to a cream due to the varnish, or the cream paint used was so pale as to weather to white....probably the former. A lighter shade of green was used on occasion alongside the darker shade, for instance on the valancing at Barmouth East signal box where it was used alternately with the white/cream. Unfortunately, the company had a reputation for leaving its stations in a deplorable state, probably due to a perpetual lack on funds, and in 1914 much of the painting work was put out to contractors. No official specifications have been discovered, and there seems to have been a lot of local variation - happily a black and white photo will distinguish beween areas painted in the two colours. Running in boards and signs on stations seem to have used the same two colours, though some enamelled signs had white lettering on a blue background. Fencing could be painted in either green or cream/white. Poster boards were all over green with 'CAMBRIAN' in white on the top panel. Many thanks to Mike Morley for help with this section. PAINTS FOR MODELLERS: Cream - Precision SR buildings cream (but see above regarding white colour). Green (darker shade) - Precision British Road Services green. 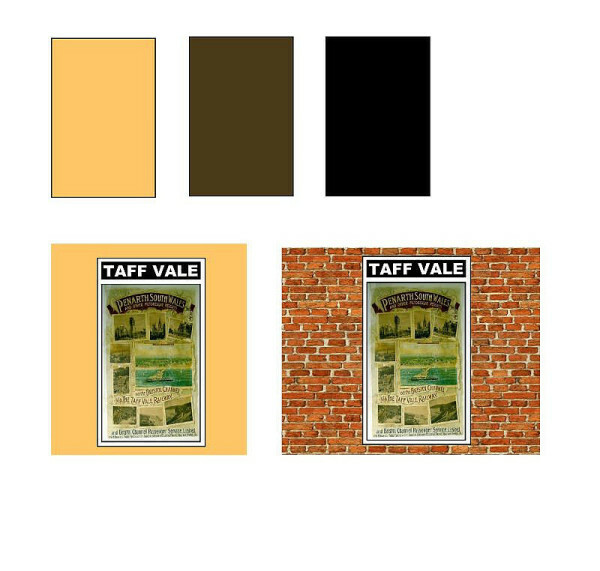 The Taff Vale used a very yellow looking buff for the majority of the paintwork on buildings, with ironwork on canopies painted white and the lower sections of canopy colums in black, probably a protective measure. Doors on stations were varnished oak, so a dark brown on a model would be appropriate. In 1914, the footbridges at Llandaff and Llwynypia were painted in reddish brown, but where this was the generally used colour is not known. Poster boards appear to have been black with white lettering. PAINTS FOR MODELLERS: Buff - I would use GWR light stone with added yellow. The B&M used a colour described as 'Salmon Brown' for the bulk of the woodwork on buildings, with framing painted black and white window frames. Salmon Brown does not appear from black & white photo's to have been a dark colour, and SR Light Stone would seem to be a good approximation. Running in boards were salmon brown with black lettering. Notices, including signal box nameboards, were enamelled, with white lettering on a dark blue background. PAINTS FOR MODELLERS: Salmon Brown - Precision SR buildings light stone. It is known that running in boards were enamelled with white lettering on a blue background. Paintwork on buildings was reputedly 'stone and brown', another case of using the cheapest pigments! Window frames were white, except on signal boxes where below floor level they were red/brown. Most of the woodwork and metalwork was painted brick red, with window frames in white (HMRS Journal April 1981). Station running in boards and signs were enamelled, with white lettering on a dark blue background. Thanks to Meic Batten for the information. Nothing seems to have been recorded about colour schemes on any of the other Welsh lines - unless you know differently, of course. It seems appropriate to include the M&SWJ here as the GWR took it over, though the directors might have preferred it elsewhere! Buildings were painted in buff & brown in the usual way, often with the canopy valencing picked out in alternate stripes. In later years they brown was used more extensively, which should be apparant from a B&W photograph. Poster boards seem to have been brown, lettered in cream or buff. Where running in boards and other signs were enamelled metal, the lettering was white on an Ultramarine blue background. 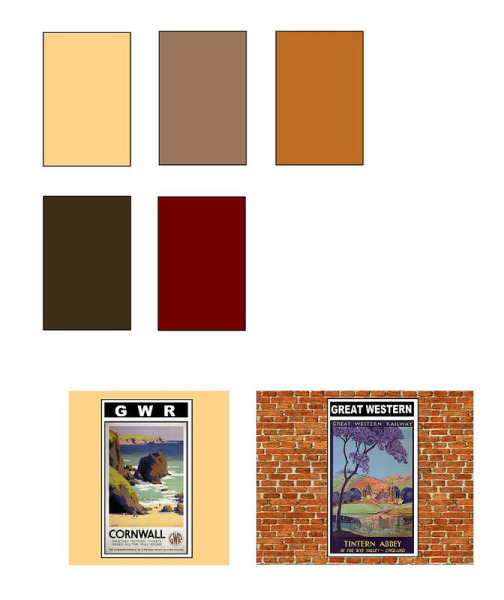 PAINTS FOR THE MODLLER: I would use Precision GWR light stone & LMS buildings brown. All the buildings on the line were wooden; the planking was painted cream with the framing, doors etc. in mid brown. Station interiors are known to have been painted in a pink shade, presumably not too bright a pink! 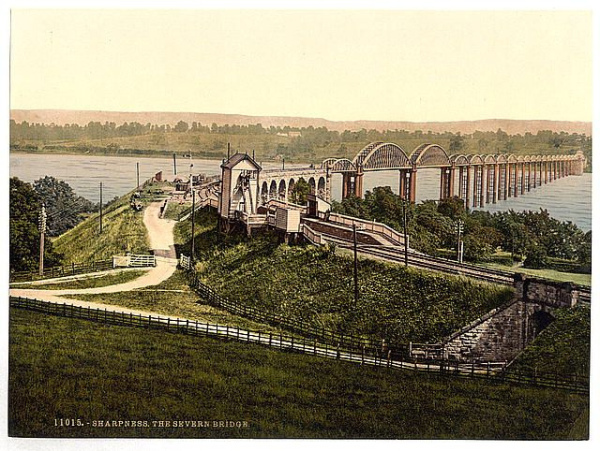 The Severn Bridge was painted in Chocolate Brown for the piers and Cream for the girders, and this probably indicates that structures on the S&W were painted in these colours....the picture below shows the bridge and the station to be in the same colours. 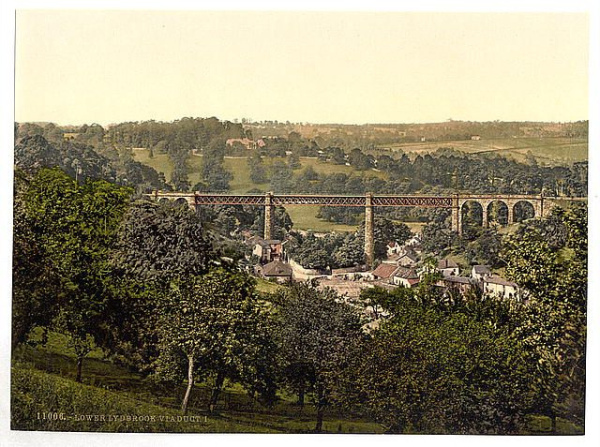 The postcard below shows the girders of Lydbrook Viaduct to have been red oxide. Station nameboards were cream with the name painted in black, shaded in red to the right & below. Poster boards were brown all over. 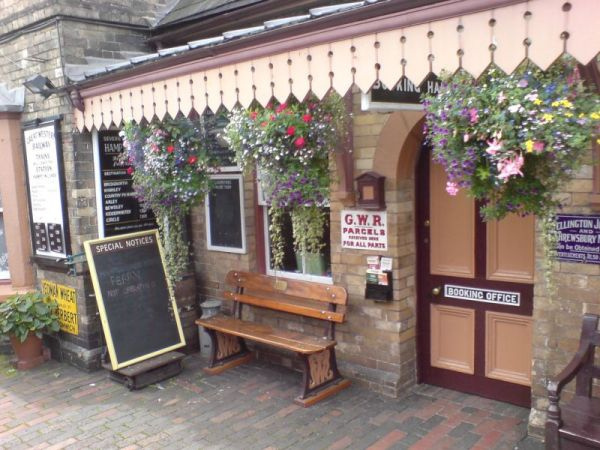 The Dean Forest railway have painted their buildings in what they claim is S&W livery, but I cannot agree; the greyish colour they have used for the walls is far too dark to my eye when compared with black & white photographs. PAINTS FOR THE MODELLER: Cream- Precision SR buildings cream. Brown - Precision LMS buildings brown. Not a GWR line, I know, but it did join the GWR at Craven Arms so it seems sensible to include it here. 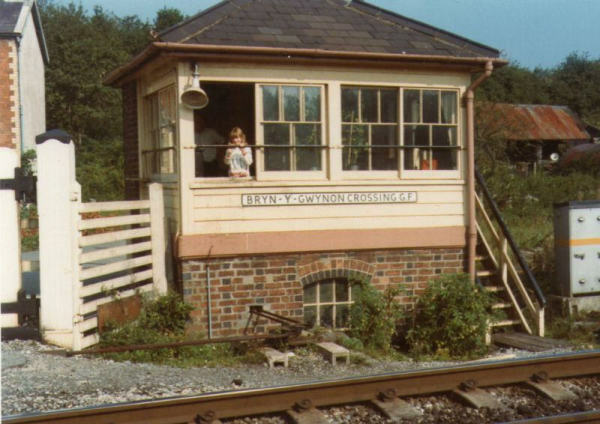 The BCR station at Bishop's Castle was recorded in 1955 as being white & red oxide; it is thought that the white was actually a very faded cream and that the actual scheme was pale cream & red oxide with white window frames. Fencing was cream. The standard painting scheme for the Western Region of BR was the standard cream with a mid to dark brown for the doors, ironwork, etc. Unlike other regions, this livery spread quickly so that few stations survived in GWR colours beyond the mid 1950's. BS381C colour references are shade 369 Biscuit and 414 Golden Brown; follow the links on the 'Colours' page for BS colour patches. Poster boards were brown, lettered in cream unlike the white of other regions, and station signs followed this pattern, including the enamelled metal ones. 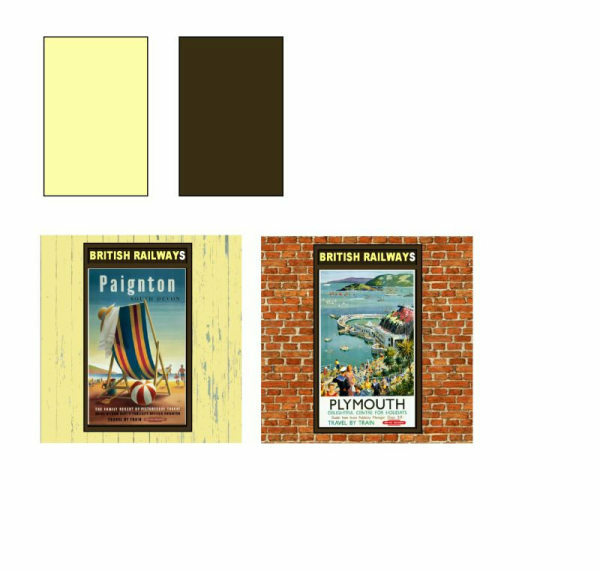 Photographs show that the colours could vary quite a lot, especially the cream, which could be a rich Cornish ice cream colour on one station, and very pale on another. Are we back to the man mixing his paint by eye on site, even at this late date? The paint was very matt in finish indeed, but seemed to wear well. The GWR was actually in the process of introducing a similar livery in 1947 to replace the light & dark stone, though of course this never got far before Nationalisation, so perhaps the BR scheme was just a continuation of what the GW intended to do anyway. PAINTS FOR THE MODELLER: Cream - Precision SR buildings cream. Brown - Tamiya flat brown. 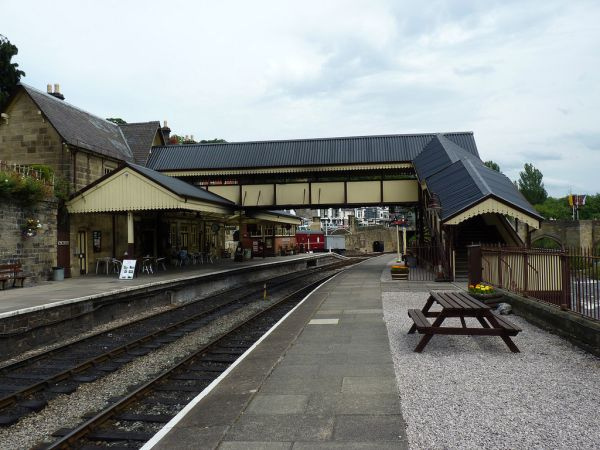 BEST PLACE TO SEE IT; Llangollen Railway, Bodmin & Wadebridge Railway.